Would it be possible to add a command /rban like they have in mcbans? I could use logblock questioner but id rather not roll people back every time. Ahh. Yeah i see no reason to run on mysql right now. I'm also too lazy to add a user to my database for remote access. I do not, but i plan to make one eventually. Why do you ask? Do you happen to have a webpage or something else hooking into the syncer by chance? Linking databases like that won't work because the data is cached in memory, so a full reload of the plugin would be required for the fresh data to be loaded into memory. I have disabled syncing. I will report back if i have another problem. I was planning on setting this up on multiple servers but i don't think that's a good idea if all of them are going to lock up when we restart. I may be better off symlinking databases or using sql. Also, can you do /mbdebug and send me Bukkit\plugins\MaxBans\debug.txt? It has the config (Blanked passwords), version info and what your database looks like, so it'll be a fairly big text file. Also, if you disable syncing.. does the issue still occur? And have you tried this one... https://dl.dropbox.com/u/72835893/Plugins/MaxBans.jar it fixes an issue where the database would never be unlocked if there was an error while the database was being modified. Yeah, I'm not going to implement it, I think if you're worried about staff kicking staff you should pick better staff. The other reason is (Unfortunately) most permission systems don't store a players permissions while they're offline. That means they can ban you and totally bypass the system if you're offline. Plus, say if you were hacked, none of your staff would have any power to 'defend' the server. Do you plan to add permissions for players not being able to kick higher staff, ie: right now my moderators are able to kick me etc, just curious for security purposes. I'm very paranoid about these things. It happens all the time, and it was more like an hour this time. I didn't import anything. I'll mark it as an issue when I get time to... in the mean time, does it happen every time, or just when you try to import some bans? 00:37:15 [INFO] [MaxBans-Sync] Stopping syncer. 00:37:45 [INFO] <AmandaNicole> Goml everyone else. That'd do it, just give it a few minutes to do it. I think like 400 or so bans. Its a limitation with SQLite. How many bans are in your vanilla bans? Running this on a dedicated server. I don't see a reason for it to freeze for that long. Just give it some time :) Most PCs its usually 10 bans/sec that can be handled. I am using SQLite. This is the second lock on shutdown. Latest version yes. It does lock when i shutdown/startup. 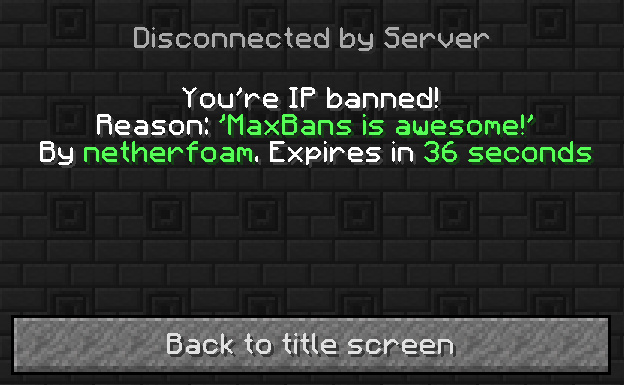 A few days ago i did a vanilla bans import.